Which Is Better? 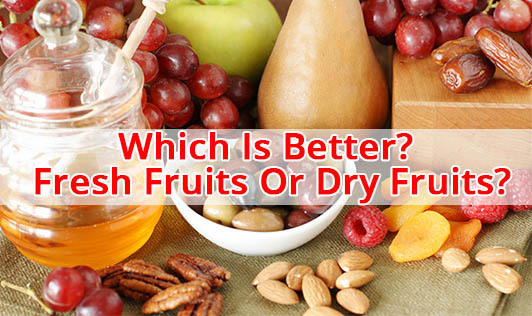 Fresh Fruits Or Dry Fruits? Dry fruits are essentially fruits which have been dehydrated either by sun drying or by using specialized equipments. According to the nut and dried fruit foundation (INC), dry fruits are great sources of total and soluble fiber in the diet. They also have a low glycemic index, just like their fresh counterparts, that play an important role in preventing different aspects of metabolic diseases. Along with fiber, dry fruits are also rich in potassium and contain important bioactive phenolic compounds, vitamins and minerals specific to each fruit. The polyphenols in dry fruits are believed to protect you from heart diseases, cancer and inflammations, the mechanism of which is yet to be understood. Now, let's see the calorie content of dry fruits and fresh fruits. It is true that 100 grams of dry fruits have much more calories compared to 100 grams of fresh fruits. This is because the weight from water is removed. When water content and portion sizes are taken into account, calories remain the same for fresh and dried fruits. It is clear that the only difference between fresh fruits and dry fruits is the water content. So make it a point to include dry fruits in small quantities in your diet along with fresh fruits to get the benefits of both.